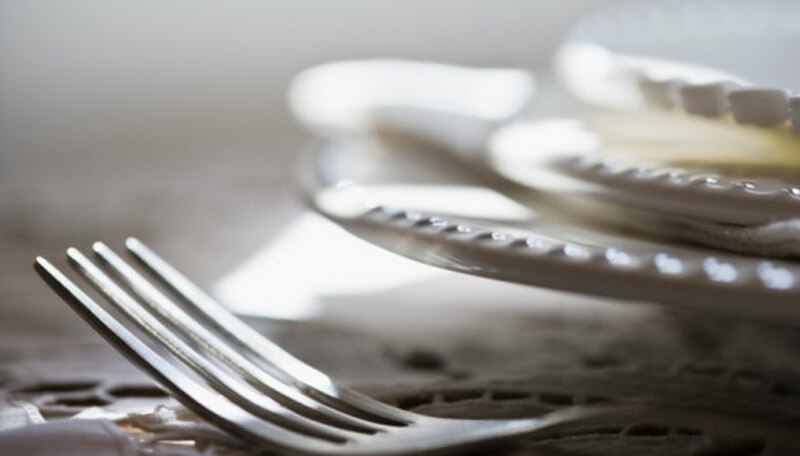 Silverware or flatware is almost always marked, and you can read silver marks on your tableware or flatware with a keen eye or a magnifying glass, particularly if you know where to look. You also need to know how to read the marks if you want to know the type of silver, silverplate or stainless you have. Collectors are usually interested in sterling silver, since it is more valuable than most of the silverplate or stainless. Check the back side of the flatware. Look for sterling silver marks. Much silver is marked "sterling" but it may also be marked .925. Less than sterling silver, but still silver, may be marked .900 or .800. Some pieces just have the English hallmarks (three symbols), and they are sterling silver. Read the marks. Check for "Plate" marks. Some of the silverplated flatware or silverware is Extra Plate or A-1 Plate. This is silverplate, not sterling silver. Silverplate has a coating of silver over a metal base that is not silver. For this reason, the plate will eventually wear down to the base metal with extensive use. Much of the silverplate is older pattern flatware, and matching pieces are a fun collectibles project, particularly if you have an inherited set. Look for common makers. See if the back is marked Rogers. Most Rogers is silverplate, no matter what else it is marked. Sometimes it has the pattern name, or Triple Plate, or A-1. These are all silverplated flatware or silverware. Know the difference in marks. Watch for marks that are stainless. Stainless is not silverplate or sterling but is stainless steel. This is what most people use for our everyday flatware today, but it was not in common use until the 1960s. Check for marks on several places. Look carefully in several locations on the silverware. It is easy to miss the marks on silver flatware. Marks may also be on the blade of a knife, or the heel of a fork. Sterling silver handles often have the sterling mark on the side of the handle, and a stainless mark on the flat blade, since they are made of two parts. My Antique Mall: What do you mean when you say silver?